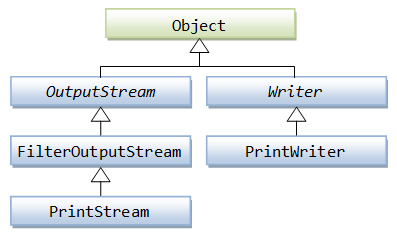 We saw in last post in Java Tutorials section what streams in Java are.Byte stream is one of the type of streams used to perform to perform input and output of 8-bit bytes.All byte stream classes are descended from InputStream and OutputStream. There are many byte stream classes. 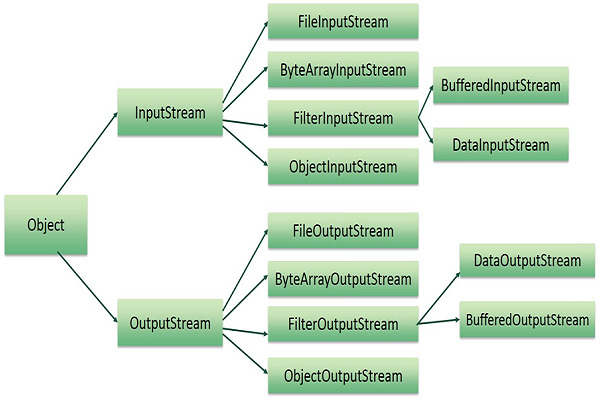 To demonstrate how byte streams work, we'll focus on the file I/O byte streams, FileInputStream and FileOutputStream. Other kinds of byte streams are used in much the same way; they differ mainly in the way they are constructed. Lets analyze the code now. We have define two byte streams FileInputStream in and FileOutputStream out. Each stream take a File object as an input which in turn takes filename as an argument.Note that you can directly give filename as an argument to FileInputStream and FileOutputStream. Also note this filename is of type String.This file must be in your source directory, if not you can always give absolute path in the place of filename. In above code we have inFile and outFile as two files in src directory.We read from inFile and write to outFile.Note that read() function return an integer and when all data in input stream is read it will return -1 which can be used as a condition to terminate our loop. Never forget to close the streams you have opened. In above code we close the streams using .close() function. Note that we are checking if the stream is open or not before closing it because if due to some error stream was not opened and if we try closing it, it will throw runtime Exception. Above code is not the best way to write it.Since Exceptions are not explained yet above code will suffice our requirements in understanding byte stream.But the more correct approach to do above is put out reading/writing logic in try statement, catch the exception to handle the exceptions like FileNotFound Exception in catch block and use the Finally block to close the streams. What is this throwing Exception? In above code observer the line throws IOException besides the main function.What it means that if there is any Exception just throw it (don't catch). Generally when a function throws an exception Exception is thrown to the function which has called the function throwing that Exception.The calling function must then either catch it and handle it or again throw it to it's parent function. So what happens when every function throws the Exception and no one catches it? If no function catches the Exception it will finally come to the main() function.If even the main() function does not handle the Exception and just throws it like what we have done in above code then JVM will just shut down, terminating the program.Lets not worry about this at this point. We will cover this in much details when we learn about Exception handling. When not to use byte stream? Since inFile and outFile contains characters the best way to do it is to use character stream which will be explained in our next post. Byte streams should only be used for primitive I/O. So why talk about byte streams? Because all other stream types are built on byte streams. Question) In switch construct , the default statement must be placed after all the case statements. Explanation) Go through the Java tutorial on switch statement to know more about switch statement and it's usage.As for our question, default statement can be put anywhere in the switch construct but it will be called only when none of the other cases match. Also since default statement is the last one to be checked we need not even write break statement in default statement.So the answer is clearly False. Question) Member (instance) variables are always assigned a default value if not explicitly initialized. Explanation) Go through the Java tutorial on Objects in java to know the difference between instance variables and local variables.As for our question, yes instance variables are assigned default values if not explicitly initialized.On the other hand compiler will complaint if local variables are used without initialization. Explanation) The answer is pretty straight forward . x=6 and y=7 so y == x is false. Negation ( ! ) of false is true and hence our final result is True. Remember brackets have higher preference than any of the operators. Question) Using a break in a for loop causes the loop to break out of the current execution and jump to next iteration. Explanation) I would recommend go through the post on Transfer Statements in Java Tutorials section.break keyword will cause loop to break out of current execution permanently and continue with the code after the loop.Note that break statement is used only in loops and switch statement.So answer is False. Explanation) I would recommend go through the post on Access Modifiers in Java Tutorials section.If a member (be it a member variable or a member function) is defined to be protected then it is accessible by members in same class, in same package and also in all the sub classes of class in which the protected member is defined. So it is not just the same package.Hence answer is False. User input is required to make our programs more interactive and dynamic.For this it is essential to know what are Input and Output streams and how they work. What are I/O streams in Java? Types of Streams in Java. Streams can hold all sorts of data from primitive types to advanced objects. In next few posts we will go through various types of I/O streams like byte stream, character stream, object stream etc. Check for links in the Relates Links section at the bottom of this post. The stream classes are used for inputting and outputting all types of binary or byte data. The reader and writer classes are used for inputting and outputting only character and String data. NOTE : When wrapping a stream you can mix and match only types that inherit from the same abstract parent stream. Note : The data source and data destination pictured above can be anything that holds, generates, or consumes data. Obviously this includes disk files, but a source or destination can also be another program, a peripheral device, a file, a network socket, or an array. Interview Question #3 What is the difference between a constructor and a method? A constructor is mandatory in a class.If you don't write any constructor compiler will write one for you.This constructor is called default constructor and has no parameters.Writing a method is completely based on user requirement. Interview Question #2 What are principle concepts of OOP? Interview Question #1 What is the purpose of garbage collection in Java, and when is it used? The purpose of garbage collection is to identify and discard objects that are no longer needed by a program so that their resources can be reclaimed and reused.Garbage collector is invoked automatically by JVM. A Java object is subject to garbage collection when it becomes unreachable to the program in which it is used and by unreachable mean that there are no references of that object on the stack.You can also specify when to invoke garbage collector using System.gc() but it is not necessary that JVM will always invoke garbage collector on encountering this function. In above code constructor sets default value of welcomeMessage variable to "default Message". So above code will print default Message to standard output. Constructors can be public, private or default. Note : If you don't write a constructor compiler writes one for you.This compiler written constructor does not have any arguments or code in it.Remember this will happen only if you have not written any constructor. constructors are use to set default values to member variables.It can also be used to initialize some instance variables when the object is created. Can we have more than one constructor for a single class? Yes you can have multiple constructors in a single class but all of them must have different set of arguments. Number and type of arguments provided while creating object will decide which constructor must be invoked.Also you can call one constructor from another using this(arguments). I understand just this description makes little sense so lets take up a fresh example to demonstrate what i just described. public Student(String name,int age) will automatically be picked up and set name and age to values supplied as arguments. Note : If you define constructor as private you cannot create object of that class.Reason being private functions can only be called in same class. So why would any one declare constructor to be private? There are cases in which we don't want to explicitly create any objects of a class.Singleton design pattern is one of the use case.We will discuss what design patterns are ans what a singleton class means and what are it's uses but for now keep in mind such cases are very much possible. constructors have same name as that of the class. constructors don't have return type. A single class can have multiple constructors having different arguments. We can call one constructor from another using this() keyword. constructor cannot be static(will be explained later). constructors don't have any return type and yet they return instance of that class. You can't create object of a class whose constructor is private. Which constructor must be invoked will depend on arguments passed. If you do not provide any constructor compiler will write one for you.This is a default constructor with no arguments. Constructor does not have return type. If you provide one it will not be constructor but a normal instance method. Above code is of no use. 'x' and 'y' variables that you see inside constructor are the ones coming from parameter 'x' and 'y'. They do not represent 'x' and 'y' instance variables. To initialize instance variables you need to use this keyword.